All the Light We Cannot See by Anthony Doerr--An enchanting story that allows us to peek into the drastically different lives of a young German soldier and a blind Parisian girl whose lives momentarily intertwine on the coast of France during the second World War. Doerr is one of my favorite authors, and I'm proud to say that I've now read all of his novels (The Shell Collector, About Grace, Four Seasons in Rome, Memory Wall, and All the Light We Cannot See). He has such a grace to his writing, and he sees the details of life (even the minutiae) and then shares it all with us so beautifully. Digging to America by Anne Tyler--I picked this up at one of the few English bookstores in Madrid because I was craving a physical copy of a book. About two distinctly different families in Baltimore who adopt Korean babies at the same time, I thought I would be more interested in it. A little cheesy and not the best writing, but hey--you win some, you lose some. Wise Blood by Flannery O'Connor--Well, this is one I'm going to have to read again. And probably again after that. (And in the meantime, I'm going to listen to a lecture from a Yale professor that's available online.) This is my first Flannery O'Connor novel, and I have to admit--I wasn't entirely sure what to make of it. The characters are extremely memorable; in twenty years if you say the name Hazel Motes, I will immediately be transported back to this novel! Anyway, I need to do a little self-study of this book to get more out of it than I did on a first read-through. Beatrice and Virgil by Yann Martel--I read Life of Pi a couple of years ago (in Madrid, actually) and I enjoyed it. So I picked this newer novel by Martel up recently in J&J's Books in Madrid. It was definitely a strange story; it had some powerful--as well as disturbing--images related to taxidermy and others harkening back to the Holocaust. Sound like a strange mix, right? I read a scathing (and poorly written) review of the novel after reading it; it seemed like many people out there truly hated Martel's newest book. However, he asks some good ethical questions and I think it's probably worth reading, especially if you liked Life of Pi. At the very least, Martel is willing to write about some difficult topics in a very out-of-the-box kind of way. Gilead by Marilynne Robinson--I read Gilead a few years ago, and I don't think I appreciated it half as much as I did this second time around. Robinson is a master with words. If you don't know the premise, the novel is a long letter from an aging father to his still-young son, telling him stories of the past and all he wants him to know before he leaves him on his own in the world. There is wisdom, there's humor, and you feel the deep love of a father for his only son. I'm about to embark on Home, Robinson's follow-up novel. 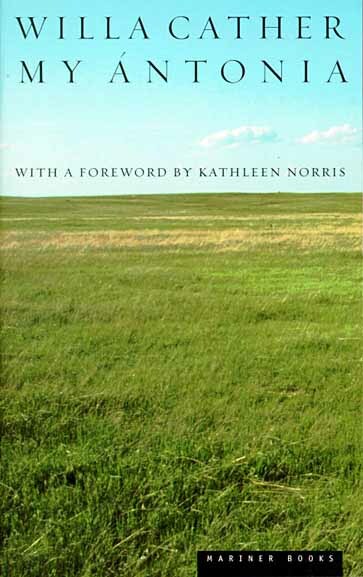 My Ántonia by Willa Cather--In high school I read O Pioneers! by Cather and I remember enjoying it so much. At some point, I went out and purchased My Ántonia, but of course it sat on my bookshelf all these years and I never read it. I very much enjoyed reading this book on our trip to Rome. It made me remember why I loved Little House on the Prairie and why I dressed up in my pioneer costume and ran around in it outside as an 8-year-old (true story...and yes, I had a pioneer costume). There is something enchanting and wild about the American West, and Willa Cather captures a picture of life there so well. Man, am I impressed by what pioneers had to do to make a life for themselves and survive!